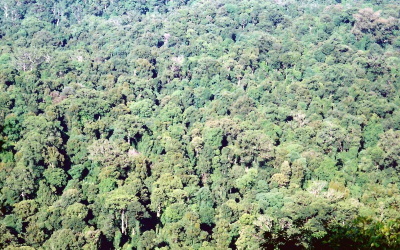 The Gondwana Rainforests of Australia (formerly called Central Eastern Rainforest Reserves) were designated a world heritage site because of their geological features. The WHS consists of no less than 41 different parks in Queensland and New South Wales. The Queensland areas include Lamington National Park, Mount Chinghee National Park, Springbrook National Park, Mount Barney National Park and Main Range National Park. The New South Wales areas include Barrington Tops National Park, Dorrigo National Park, Mount Warning National Park, New England National Park, Oxley Wild Rivers National Park, Washpool National Park, Willi Willi National Park and Werrikimbe National Park. I visited this WHS in December 2017. Of the several locations that make up this WHS, I visited Lamington National Park and Springbrook National Park, focusing mostly on the Green Mountains area of Lamington National Park. I drove away from Brisbane before sunrise and I got to the winding roads up the inscribed area of Lamington National Park very early in the morning. We saw several wallabies, koalas and birds along the way. Due to roadworks, we drove through Canungra and parked our rental car near the National Park Visitor Centre which has a very small 'World Heritage Room' downstairs with some information boards on the inscribed areas, wildlife and geological features of this WHS. Here we used the boot cleaning brushes to keep out any potential pathogens from the rainforest. After a short 1.8km walk on the Centenary Track, we hiked for about an hour to the Python Rock Lookout (5km) and for about an hour and a half to the Moran Falls Lookout (6.2km) into the rainforest. Here we saw lots of birds such as the Southern logrunner, the paradise riflebird, the grey and rufous fantails, the golden whistler, the Eastern yellow robin, the yellow-throated and white-browed scrubwrens, the Wonga pigeon and two of the noisiest birds in the rainforest canopy: the Eastern whipbird and the green catbird. Their mating calls and displays were unmistakeable and a fond memory I'll surely cherish for a long time. We also hiked towards the Border Track which has very interesting information boards towards the very beginning of the track briefly explaining circa 23 million years of the park's geological history which had such an important impact on the flora's evolution (ex. primitive conifers and ferns) when the last basalt lava flowed down from the 2000 metre Tweed volcano. Some of these plant species survived from prehistoric times when Australia was still part of Gondwana (some 200 million years ago) and they were quite easy to spot along the track. Since we had enough time, we ventured past the Border Track and towards the Box Forest Circuit and part of the Binna Burra Track but never finished them. Instead, we spent more time at Picnic Rock and Elebana Falls which are usually quite busy but were empty just before sunset. Here we spotted a playful Crimson rosella and the rare Lamington freshwater crayfish (photos). As it was getting dark, deeper in the rainforest, we hurried back in the direction of O'Reilly's where we enjoyed the incredible display of sun rays penetrating the rainforest and highlighting the various strangler figs and epiphytic plants. When most of the few tourists were gone, we also did the Treetop Walkway Loop and it was fun to climb a 30 metre tree and rise over the canopy. Here we also spotted an Australian king parrot. As we drove away from Lamington National Park, we stopped to enjoy sunset at one of the lookouts in the inscribed Springbrook National Park before heading back to the highway. We enjoyed our day at Lamington National Park and found it to be less crowded than the Blue Mountains for example. That said, Australia's parks and trees are a bit overrepresented with 3-4 separate WHS. The Dorrigo National Park is popular partly because it is a perfect example of the ancient rainforests but also because it’s easily accessible from coastal holiday towns like Coffs Harbour. It takes about 90 minutes to drive from the beach, through small villages like Bellingen and rural bush. The final road up the hill towards the entrance to the park gives you a taste of what is to come with ancient trees creating a tunnel in parts and then occasionally opening up for a wide view across an army of trunks. At the visitors centre at the entrance to the park is a skywalk that takes you out above the forest so you can see the extent of its reach. 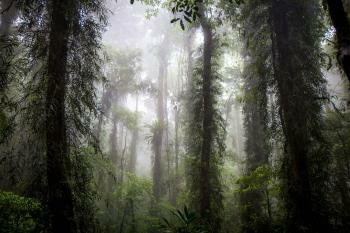 The faint sounds of animals drift up from below but they are protected under the green canopy. To get a closer look, you need to take one of the several tracks that lead you to different parts of the rainforest. The walk to the waterfalls is one of the most popular. 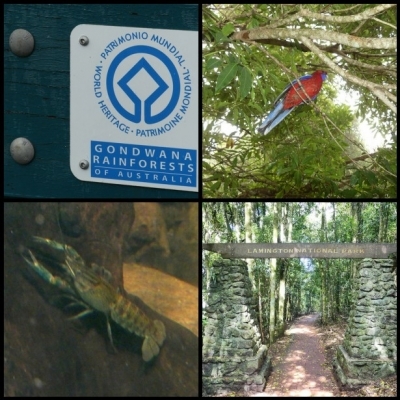 One of the most impressive sections of the rainforests is the Rainforest Centre at Dorrigo, NSW. There is a 'sky walk' that takes you over the forest canopy and has sweeping views out towards the ocean. Add to this a beautiful 3 hour work on a path through the forest, truely magic. This is a scattered site made up of a number of unconnected national parks. There is a very informative Site Information office in the town of Murwillumbah, with very helpful staff. The town is served by buses travelling between Byron Bay and the Gold Coast, but trains no longer run there. We rented a car for a few days to visit the site. The salient feature of the site is Mount Warning, named by Captain Cook over three hundred years ago. It sticks out like a thumb in the centre of a huge crater. We hiked though the bush around the base of the mountain. Because the site is sacred to the local Wollumbin people it is not recommended to climb to the top. Great views of the whole crater can be seen from the rim of the crater. We found a great lookout up in the Springbrook National Park. From "Central Eastern Rainforest Reserves (Australia)" to "Gondwana Rainforests of Australia"
Extensions on Tentative List: The proposed additions are located within the same broad geographic range as the existing World Heritage Area with a northern extension to include the Bunya Mountains National Park. A total of 689 364 hectares is proposed for addition.